For 2014, skincare is taking a different approach to dealing with aging skin! Rather than “fight” against wrinkles and dryness, how about we try to adapt to our surroundings? Instead of spending our time and energy fighting against external aggressors, it may be time to accept the world we’re in and enjoy the power of nature along the way. When the harsh winds blow, the sun beats down and the UV rays beam down on us day in and day out, it may seem like we are constantly fighting against the elements. 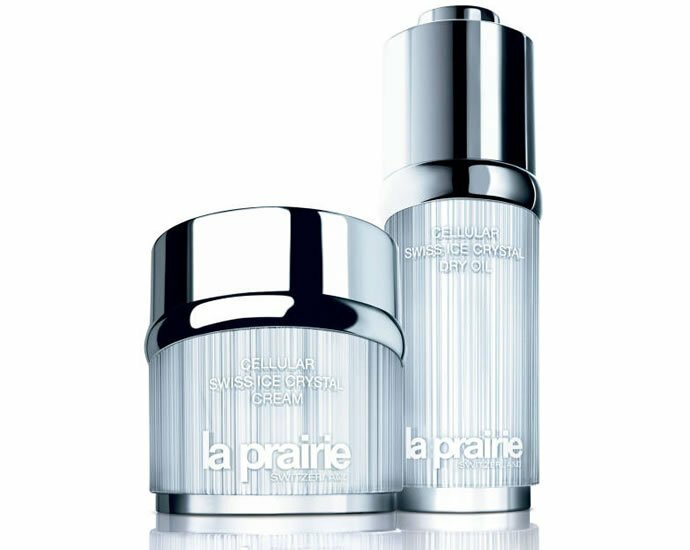 Too bad for our skin, but La Prairie has a solution for us that started on the very top of a mountain. La Prairie went to the Swiss Alps, one of the harshest environment on earth, where there is nothing but ice and a relentless sun. Scientists discovered fragile plants that have evolved not just to survive but to thrive! Purple Saxifrage — A tiny flower theta envelops itself into ice crystals to outlast extremes of cold, ice and altitude. It awakens with the warmth of spring. Soldanella Alpina — A fragile bell-shaped flower that stores fuel in its leaves to melt a place for itself to blossom through the ice. Swiss Snow Algae — Lies dormant beneath the ice in winter, surviving extreme temperatures, only to re-emerge as a crimson blanket on the surface of the snow in spring. Cellular Swiss Ice Crystal Cream — This moisture-rich cream melts instantly into your skin, immediately helping to restore its youthful appearance. It works to fortify your skin’s resilience to life’s ever-increasing aging assaults. Biotechnology and plant stem cells help renew the look of firmness and smooth the appearance of wrinkles, while drenching skin with hydration. Cellular Swiss Ice Crystal Dry Oil — The sheer, weightless dry oil instantly becomes one with your skin by helping support your skin’s natural lipid barrier function. Pure oils seal moisture within your skin longer than any other serum. Gentle botanical extracts soothe and nurture, while you’re left with a subtle glow. You can also drop it into the cream for even longer lasting hydration. And the smell alone will have you hooked from the moment you apply it to your face. The new age of timeless beauty with the Swiss Ice Crystal Complex will help skin protect itself from the environment and time. Are you going to “adapt” to instead of “fight” against your wrinkles this year? I am have been fighting against my wrinkles and will continue to do so! I’m going to try to adapt but it’s an every day struggle to try to keep up with my skin care routine and being consistent when you have a busy mommy life!,I know no excuses ! These products sound awesome I need to get my hands on them soon, great review Theresa! !